SNAFU! 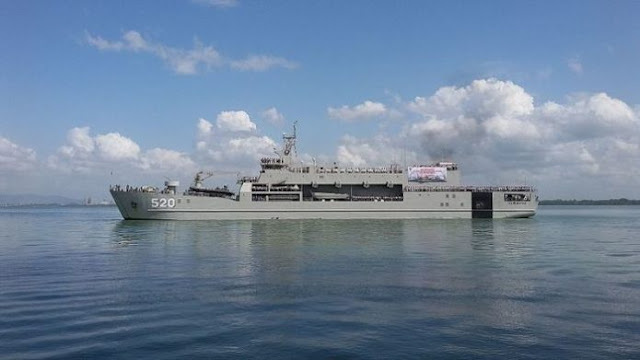 : Indonesia building a 300 ship Navy??? via Defense and Security Monitor. Ok. So Indonesia is putting into service another amphibious ship. No big deal right? I mean they have a ton of islands so this only makes sense right? What happens when you claim to be the big boy on the block but everyone in the neighborhood has firepower that at least rivals your own and they only play in the "hood" and don't have to roam all over the city? It means that you might be big but you ain't necessarily bad. Why? Because you can't be in two places at the same time. At least not in force. Why all the drivel above? Because one thing is obvious. Our Navy is WAAAY too small for the world we're entering (we might already be there). As a matter of fact Reagan's 600 ship Navy might be considered the starting point to cover the world and more than half that mythical fleet would need to be committed to the Pacific. In light of strides being made by ALL the nations of that region, we've got to rethink our drink. Long range strike, long range missiles and the platforms to deploy them is the way forward. For the Air Force that means a return to the days of Strategic Air Command. We need a motivated, dedicated and substantial bomber force. We have the high end bombers covered. Tac Air can't cover our needs in that region. So we probably need a low end replacement for the B-52. In essence a big flying missile truck that can haul long range anti-ship/anti-surface missiles a long way at high subsonic speed (just talking about airliner cruise speed). For the Navy it means Missile Ships...I'm talking Battleship sized ships that are filled to the brim with anti-ship and land attack missiles that can reach a long way and have small crews. Additionally they should have enhanced survivability features built in. What are those features? Don't know for sure but they've got to be there for damage control because they won't have the crews to shut hatches and control flooding. The people aboard the ship will have to care for wounded and fight the ship when they're in contact. What about the USMC and Army? Keep SOCOM if that turns you on but realize that growth isn't gonna be there. Modernize EVERYTHING! When we enter that region on the ground its gonna be EXTREMELY kinetic. EXTREMELY lethal. Move forward with unmanned ground systems. Make sure the Kill Net is up and running. Digitize and Ruggedize systems so that lost comms will not be a mission kill! The Pacific is looking more and more dangerous and the nations there more and more dangerous.